Left: A charcuterie plate at Café. Right: Art Science; the restaurant’s bar, which serves a cigar-infused Manhattan. Restaurants were never a thing in this historic college city—which is precisely what allowed its chefs to get so wicked good. For Boston chefs, the make-it-there, make-it-anywhere cliché about moving to New York has never really applied. This is a place that nurtures its own, and because chefs and restaurateurs have room to move up, they don’t often feel the need to move out. That helps explain why, over the past three decades, the city has been slowly incubating one of the best dining scenes in the Northeast. And yet it remains underrated—perhaps because of its stuffy, historic façade. Beyond the brownstones, Boston is far from conservative, especially when it comes to food. With more than 50 institutions of higher education, this is, after all, a place that runs on youth and new ideas. And right now the Boston area has flavors you won’t find anywhere else in the U.S.: some of the most inventive Japanese food in the country; James Beard Award–winning charcuterie; and eastern Mediterranean food of a refinement that draws chefs from around the land to study it. The best part? These restaurants are all in the hands of chefs who have helped one another grow and fostered kitchens where people rise though the ranks. That’s just how Boston rolls. Innovation is at the heart of Cambridge, Boston’s neighbor to the north and home to both Harvard and the Massachusetts Institute of Technology. So it made sense for David Edwards, a Harvard professor who did a stint as a tech entrepreneur in Paris, to locate his first restaurant, Café Art Science, in an avant-garde white space close to MIT in Kendall Square. Its chef, Patrick Campbell, serves immaculate, up-to-the-minute cuisine you’d find in a Parisian bistro, with an American accent, including the city’s best roast chicken and its silkiest foie gras—classic dishes executed with a skill and sophistication not often found outside France. The bar, though, is where the wild stuff happens: bartender Todd Maul runs it like a mad scientist, using Le Whaff, an evaporator of Edwards’s design, together with every distilling technique and digestible chemical at his disposal (his version of the Manhattan, for example, is infused with a cigar). Just a few miles north, in the neighboring city of Somerville, is another culinary world. At Sarma, a crowd of students, teachers, urban pioneers, and well-heeled suburbanites sit in an airy, turquoise-walled storefront hung with ceramic plates of every color. 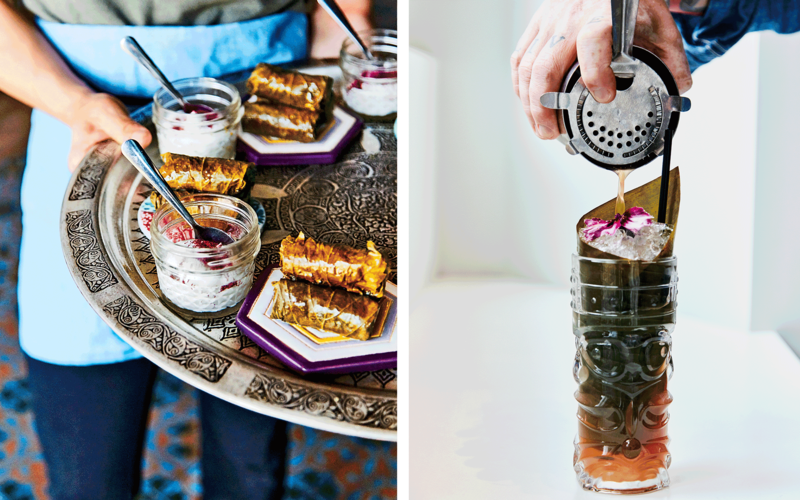 Equally kaleidoscopic is the eastern Mediterranean cooking. You’ll encounter Levantine spices such as cumin, cinnamon, Aleppo pepper, and harissa; variations on tarator, the Eastern European walnut-garlic-yogurt sauce; and muhammara, a red-pepper-and-nut dip. Every so often servers come by bearing irresistible saucers containing, say, fried chicken, which comes flecked with toasted sesame and nigella seeds and dusted with dried green chiles. The restaurant is the creation of chefs Ana Sortun and Cassie Piuma. Sortun’s budding empire also includes Oleana and the café-style Sofra, both in Cambridge. All are eastern Mediterranean in flavor, and all their kitchens are run by women. This is no coincidence; in fact, championing female chefs is one of the things that sets Boston apart. This is also the city that gave rise to No. 9 Park’s Barbara Lynch, who in 2014 won the James Beard Outstanding Restaurateur award, a title almost always won by men. Watertown’s Branch Line, where the rotisserie is the star of the show. There’s such camaraderie among chefs, like nowhere else I’ve found,” says Ken Oringer, one of Boston’s most high-profile entrepreneurs. Since opening Clio, his restaurant in the Back Bay area’s elegant Eliot Hotel, in 1997, Oringer has helped train a roster of star chefs—most notably the talented Jamie Bissonnette, who helped Oringer open Toro, the celebrated South End tapas bar. Bissonnette then took his remarkable charcuterie to the pair’s Roman-style trattoria, Coppa, also in the South End, where the meatballs and lusty carbonara became must-haves and helped Bissonnette win a James Beard Award. Oringer, meanwhile, had fallen in love with the cooking of Japan, so he quietly turned a small downstairs area of Clio into a six-seat sashimi bar named Uni. There, he started incorporating every cuisine he knew—French and Italian, as well as Catalan and Japanese—into sashimi and sushi. The tiny bar became Boston’s hottest secret, so this year Oringer turned all of Clio into one big Uni. The newly expanded restaurant looks like an old-money Japanese inn: all dark wood, with a wall of clay barrels for shochu, the rice (or sweet potato) distillate that is Japan’s grappa. The pungent variations on sushi and grilled dishes combine classic flavors with a freewheeling sense of imagination, like deep-fried papery shishito peppers and lightly smoked sea urchin with Israeli caviar and a soft-boiled quail egg. Another young chef to recently open his own place is Alex Crabb. 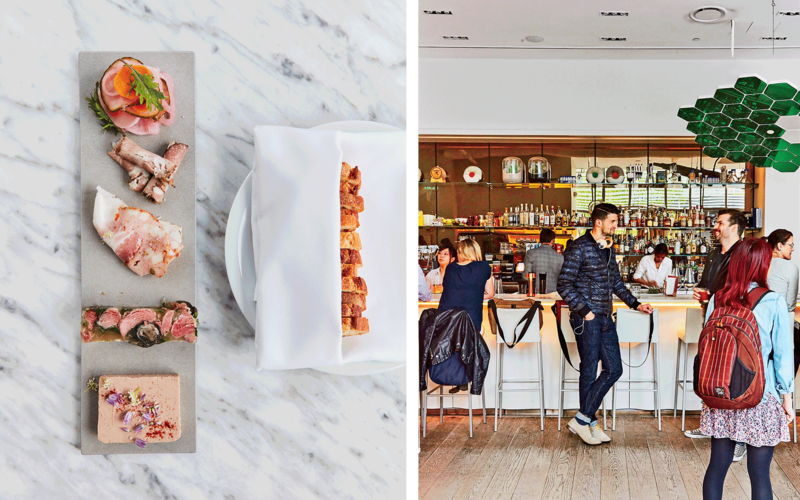 After seven years in the kitchen at L’Espalier, he and his girlfriend, Shish Parsigian, debuted an idiosyncratic tasting restaurant called Asta. Crabb, who did a stint at Noma in Copenhagen, was inspired by Denmark’s spartan aesthetic, so diners at Asta sit at school tables with tidy little drawers for the silverware and napkins. It’s the food, though, that brings life to this place. Duck egg with foie-gras purée; an ingot of almond cake with little cubes of poached rhubarb: the food is as spare as the décor, but as warm and faultless as the couple who created it. Left: A tray of apricot dolmades with pistachio labne and sumac at Sarma. Right: A John and Leonie Circumnavigate the Globe cocktail, from Cafe Artscience. Harker encouraged one of his front-of-the-house managers to set up Branch Line, inside a former bank building in nearby Watertown. There, at one end of the long room, chickens on a vertical rotisserie over open flames cast a mesmerizing glow. The drippings from the rotisserie, however, make the dishes truly special. They find their way into sauces for grilled vegetables, steak, even the chicken soup. Order some just as a dip for bread—an airy yet chewy francese loaf from Iggy’s, in Cambridge, the Boston area’s best bakery. In the rest of the country, it can be tough for young chefs to open their own restaurants, but in Boston even these upstarts receive moral support from their former bosses. Marc Sheehan worked as chef de cuisine under Jason Bond, whose cozy Cambridge restaurant Bondir serves pitch-perfect food based strictly (but never showily) on local ingredients. Sheehan ran with the theme—ran backward, in fact—when he opened an East Cambridge restaurant called Loyal Nine, inspired by traditional New England cooking. There, the highlight is soused bluefish, in which the region’s best-flavored fish is steeped in vinegar and served on rounds of molasses-spiked brown bread. Eating it in the midst of this lively neighborhood as a freight train slid quietly by my terrace table felt like stepping back in time. But what about those New York ambitions? Harker points to Oringer and Bissonnette, who three years ago opened a big version of Toro near Manhattan’s High Line. For a while it looked like Boston might at last be losing some of its best talent to New York. Then a funny thing happened. The restaurant did fine; it got warm welcomes in a not-always-warm city. And that got New York out of their systems. 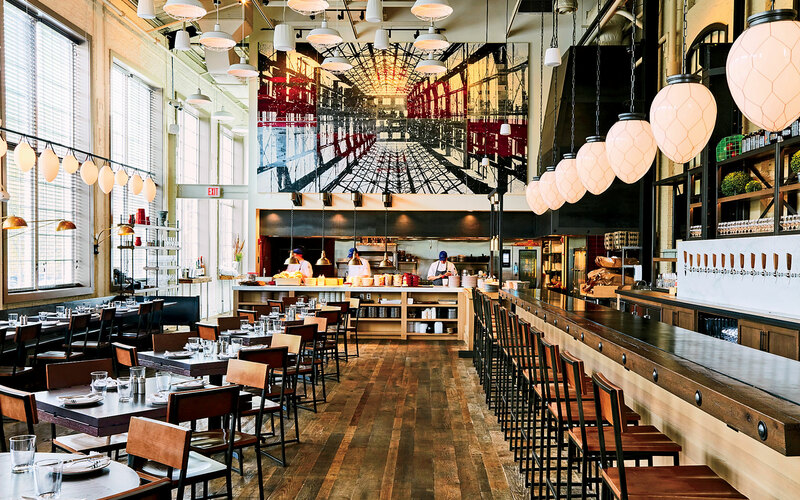 Oringer came back to expand Uni, saying, “In Boston people can take a deeper breath and express themselves.” Creativity, collaboration, room to roam free—these are the things that bring chefs to Boston and keep them there. And that’s what should bring diners there, too. Asta Chef and Noma alum Alex Crabb and his girlfriend, Shish Parsigian, offer their take on New Nordic cuisine at this high-ceilinged space in the Back Bay. Tasting menus from $50. Branch Line This bright spot in a repurposed 19th-century arsenal is known for its roast chicken and rotisserie drippings. Watertown; entrées $12–$25. Café Art Science Contemporary American cuisine with a French accent, served Parisian-bistro style in a glass-walled building in Kendall Square. The bar and associated laboratory puts a high-tech gloss on a complex that combines learning, innovation, and flavor. Cambridge; entrées $18–$38. Flour Bakery & Café James Beard Award–winning pastry chef Joanne Chang serves generous, sunny takes on classics like chocolate brioche and lemon meringue pie at her many locations around town. George Howell Coffee This elegant space in the Godfrey Hotel serves some of the city’s best small-batch brews from a specialty coffee pioneer who influenced a generation of roasters and continues to set the standard. Downtown Crossing. Loyal Nine Chef Mark Sheehan pays tribute to New England’s historical cuisine. The restaurant features modern décor and a pleasant terrace beside the train tracks. Cambridge; entrées $18–$22. Oleana This restaurant, which has a kitchen run by women and an enchanting garden that is open into the fall, serves Ana Sortun’s original, Pan- Mediterranean dishes. Cambridge; entrées $25–$28. Sarma A colorful, airy neighborhood restaurant serving Cassie Piuma’s Mediterranean comfort food, with small plates on trays in a lively room hung with ceramics. Somerville; entrées $5–$17. Sofra The standouts at this Mediterranean café are pastry chef and co-owner Maura Kilpatrick’s irresistible creations, like chocolate-hazelnut baklava and almond-rose cake. Cambridge. Uni Restaurateur Ken Oringer’s hopping sushi and sashimi restaurant has elegant dark-wood Japanese fittings that belie the Catalan, French, and Thai influences in its high-energy, vibrant dishes. Back Bay; entrées $6–$22.